Delicious Peanut butter for Bread, toasts, chapathi and more food items. 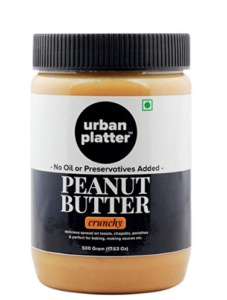 Buy the Urban Platter Crunchy Peanut Butter, 500g [All Natural, No Hydrogenated oil, No preservatives] worth Rs.250 at Rs.125 only under Amazon’s lightning deal sale. A delicious spread on toasts, chapatis, parathas & perfect for baking, making sauces etc. No Hydrogenated oil. No preservatives. Contains nominal sugar (flavour enhancer, but not sweetened). Made in India; with Peanuts which have been grown and processed in India.